ICCP’s IT & Cyber Security Forum: Is PH Ready to Go Digital? ICCP’s IT & Cyber Security Forum: Is PH Ready to Go Digital? The Philippines is gearing up to become a digital nation. There are challenges, however, that prevent the country from taking advantage of innovations and growth opportunities in the field of IT. There is still a need for a national framework for faster internet and data connection, and cyber security regulations, for instance. Without it, the country will stifle its potential for innovation and hinder the development of its digital systems. 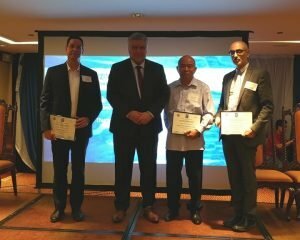 During the recent “IT & Cyber Security Forum: The Road to a Digitally Empowered Society” at the Marco Polo Plaza Hotel in Cebu, Israel Ambassador to the Philippines Effie Ben Matityau emphasized that with a solid foundation in IT and cyber security, the country holds promise in forging long-term partnerships with his country. The forum was part of Colors of ISRAEL Cebu presented by the Embassy of Israel in the Philippines and in cooperation with the Israel Chamber of Commerce of the Philippines (ICCP) and Cebu Chamber of Commerce and Industry (CCCI). ICCP Vice President for External Affairs and Director of Dayanan Business Consultancy, David Elefant shared that the number of Israeli companies planning to start a business in the Philippines is growing, prompting the need for a stronger IT infrastructure and tighter cyber security laws. While the digital programs introduced by the government looked promising, Sagiv Massad, Director of Technology and Cyber Security at consulting company Business Profiles and Director of ICCP, emphasizes the importance of defending assets on the cyber domain. In the Philippines, there is still a general misunderstanding about the nature of cyber attacks, he said, in a presentation. As a semi-military operation, crisis management during an attack only has little to do with IT, he added. Massad, a retired Israeli Air-Force Brigadier General who headed operations planning, advised that instead of focusing solely on task outsourcing and implementing tougher IT policies following an attack, there is a need to build a balanced cyber defense. It can be done by striving for balance on three fronts: technology, culture and procedures, and human resource. Through a holistic approach to cyber security and conducting cyber security readiness reviews, businesses can adopt better threat-awareness capabilities against possible attacks. Taking inspiration from the “starting up nation that became a startup nation,” the Philippines gears up for a culture of innovation similar to Israel’s. By laying down the foundation for a better IT and cyber security framework, the country can hopefully build an ideal home for Israel businesses and opportunities.